MAINAU, Germany -- In a sweltering white tent on an island in Lake Constance, bordering Germany, Austria and Switzerland, three dozen Nobel laureates on Friday signed a declaration for action on climate change. The letter says that growing prosperity among humanity has environmental consequences that in turn threaten prosperity, adding that countries must move decisively at the U.N. Climate Change Conference in Paris in December 2015 to limit future greenhouse gas emissions. The tiny, flowering island of Mainau was the site of another declaration from Nobel laureates 60 years ago, warning of the effects of nuclear weapons. 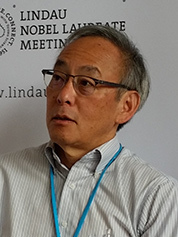 Former Energy Secretary Steven Chu at the Lindau Nobel Laureate Meetings in Germany last week. Photo by Umair Irfan. "So far, we have avoided nuclear war, though the threat remains," the climate declaration states. "We believe that our world today faces another threat of comparable magnitude." The declaration was the culmination of the weeklong 65th Nobel Laureate Conference in Lindau, Germany, which drew 65 recipients of the prize to present their research, their biographies and their ambitions to scientists early in their careers. Brian Schmidt, who received the 2011 Nobel Prize in physics for his determination that the expanding universe is accelerating, presented the declaration. "Those of us who do sign, sign because we believe we have a moral obligation to support the veracity of the processes that have led to the scientific consensus around climate change expressed in the [Intergovernmental Panel on Climate Change] reports," he said. One by one, 36 laureates walked up to the stage to sign the declaration in front of hundreds of early-career scientists and researchers. However, the signatories acknowledged that not everyone was on board, even among the scientists at the meeting. Earlier in the week, Ivar Giaever, who received the 1973 physics Nobel for his work on quantum tunneling, delivered a lecture questioning the science and policies behind climate change. "I would say that basically global warming is a non-problem," he said. Giaever described President Obama's proclamation that no challenge poses a greater threat to future generations than climate change as a "ridiculous statement." "I say this to Obama: Excuse me, Mr. President, but you're wrong. Dead wrong," Giaever said. "I think Obama is a clever person, but he gets bad advice." In the second row of the audience during his talk was Steven Chu, who served as Obama's Energy secretary from 2009 until 2013 and crafted many of the administration's policies on climate and energy. Chu received the Nobel Prize in physics for his work on trapping and cooling molecules with lasers. But even among the scientists who acknowledged human-caused climate change as a threat, Schmidt noted, it took more effort than anticipated to reach an accord. "Nobel Prize winners are very diverse people. They come from all walks of life, all political persuasions," he said. "They are also control freaks." However, preventing the rise in global average temperatures from shooting past 2 degrees Celsius above preindustrial levels is a mounting challenge as policy has yet to match the urgency of the problem. "It's getting more difficult," Chu said. "The world is not moving fast enough, it's not moving hard enough, and I am getting more concerned. Having said that, we should also not think it's too late. 'Too late' is an easy excuse to say, 'I'm not going to try anymore.'"